Last Sunday I spent the day lolling around at the womens’ beach in Tel Aviv with two new friends from the Rova. Busy ladies we are, so it was a wonderful to charge our batteries for the coming week of Shavuos planning and preparations. After our day of sun, we re-entered Jerusalem and our normal list-run lives; but first we decided to run into the shuk at Machene Yehuda for a few things. Each day the shuk pulses to a different beat. Sunday it is barely breathing. Many stalls are shuttered, and the usual owners are replaced by stand-ins. The aisles are clear of the squeezing and bumping that is the norm later in the week. Tova took the opportunity to run over to her granola guy who toasts grains nuts and dried fruit in a wok. We each bought a great tub of the stuff for 28 shekels. Then we headed to the lettuce stall where we bought long lovely bug-free romaine for a pittance. This also is where I load up on fresh herbs: mint, basil, dill and parsley this week. You can also buy aromatic thyme, cilantro and oregano here. It is said that great cookery requires, demands, fresh herbs. Even in America, where I could not usually find bug-free herbs, it was really worth the effort to buy and clean at least one bunch each week. Yes, it's a hassle to check these greens for those despised and forbidden bugs. But there are recipes that really need fresh herbs such as the basil in pesto and parsley in tabbouleh. 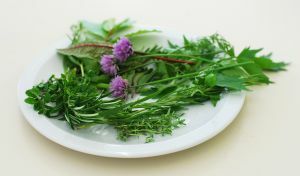 However, many times a dish calling for fresh herbs would be fine using dried. Salad dressings, dips, marinades and sauces can usually use dried because the herbs refresh in the liquid as their flavor releases. 1 teaspoon dried=1 teaspoon fresh. If the dried is new this should be enough but if it's been around a while, it has probably lost some potency so you’ll want to add more. Here’s a neat trick to make dried herbs come alive: take a few parsley leaves and any dried herb you want to use. Chop these two together. The fresh parsley enlivens your dried herb and adding a bit of parsley to almost anything is OK as it is so adaptable. Fresh herbs are abundant and a bargain in the summer months. But so often I’ll use a fraction of the bunch I bought. I cannot bear the waste. So I check, wash & dry them well, slip them into a small freezer bag and then into a larger one that holds all my frozen herbs.They do become limp so they aren’t good for garnishing, but I can use them in the same proportion as fresh in most recipes... including the two links in the box to your left. So, nu? What do you think of the first Queen in the Kitchen monthly newsletter? I'd really like your comments and suggestions. < a>Thank you for being a part of this new venture.